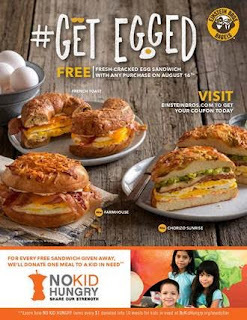 7 Kids and Us: Einstein Bros Bagels #GetEgged FREE Fresh Cracked Egg Sandwiches on 8/16! Einstein Bros Bagels #GetEgged FREE Fresh Cracked Egg Sandwiches on 8/16! Einstein Bros Bagels is partnering with No Kid Hungry starting on August 16th 2016. Stop in on the 16th to get your FREE Fresh Cracked Egg Sandwich. For each sandwich they give away, they will give ONE FREE MEAL to a kid in need. What a great idea! You get a free YUMMY sandwich and a kid gets a meal. The French Toast Egg Sandwich with Applewood Bacon, Maple Shmear and Cheddar Cheese on a Fresh-Baked French Toast Bagel. I think I am going to try the Farmhouse..it sounds delicious! You will need to Download your free voucher at einsteinbros.com and please help spread the word on social media using the hashtag #GetEgged and be sure to tag @einsteinbros. Jamba Juice NEW Protein Smoothies Are DELICIOUS!